If you've been keeping an eye on new game pages on our site, you might have already noticed, but over the last few days, three classic games have received age ratings, indicating that they will be making their way to the Virtual Console soon. Possibly the most important to most people is a rating from the OFLC in the form of Faxanadu, an action RPG on the NES that is not unlike Zelda II. A spinoff of Nihon Falcom's Xanadu series, which is practically unknown outside Japan, and published by Hudson Soft, you have to make your way through one giant world located on the branches of the magic World Tree, entering a number of dungeons to procure items necessary to move further up the tree. Like Zelda II it includes an EXP system, so there might be a few spots where you will have to grind on enemies before you're strong enough to continue. Just yesterday, however, another two games were rated by the German USK. 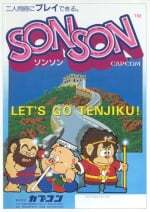 SonSon and Exed Exes are both new Virtual Console Arcade titles for Japan this month (With SonSon already released), but it seems like Capcom is planning to bring these elsewhere as well. They're not exactly of the same calibre as Final Fight or Street Fighter, but they're still decent little titles that might be worth checking out when released. In other Virtual Console news, Nintendo of Europe has already revealed that next week will thankfully have another retro title available for download. Mystic Quest Legend, known to most as Final Fantasy: Mystic Quest, is a pseudo-spin-off of the Final Fantasy series meant for people new to RPGs, with a fairly low difficulty and a pretty straightforward adventure. Naturally, we'll review it soon after release. Will you be spending any Wii Points on these titles when they're released? I know that picture anywhere. Just wait till thatguyfromfaxanadu sees this. It one of my all time favorites. Just can't wait! Love it LOVE it LOVE IT! !!!!!! May get Faxanadu. Not immediately though. Mystic Quest looks too dated for a SNES game. So I'm not interested in that. Neither am I interested in the arcade games - I have them on a collection and I didn't much like them. But its good that Capcom is releasing VCA games. Meh. I want Adventure Island 2 and 3, Hudson! FAXANADU!! I do remember actually enjoying that game, may download! Faxandu's one of my favourite NES games. Won't be downloading it though, since I still have the NES cart. Faxanadu's finally been rated. Nice. Personally, I felt it hasn't gamed well, but it's still good fun. The rest...not so much. In fact, some of those are laughable. Too bad. May get Faxanadu and Mystic Quest. Only time will tell. Mystic Quest and Faxanadu for me. Please, The Battle of Olympus next? Too bad Sonson and Exed Exes are pretty bad. It's better than nothing, I guess. I haven't played Final Fantasy Mystic Quest, but I'm under the impression that it's a good RPG. Didn't know it was from Nihon Falcom and Hudson (two of my favs, the former for the excellent Ys book I & II I played). I'm also waiting for thatguyfromfaxanadu to see this as I'm reminded of the game everytime I see their name... who was that guy from Faxanadu anyway, lol????? Kudos to those that mentioned the defunct Broderbund company's games of Guardian Legend and Battle of Olympus... GL is godly with with it's two-in-one game style of vertical shmup and action RPG, similar to how Blaster Master combined side platformer and overhead adventure-- a MUST play. BoO had it's hair pull moments but it was a fun play as a Zelda II knock off though. Jury is out on SonSon and I'll pass on Exed Exes. Mystical Quest I couldn't get into, I was too advanced in RPG gaming to actually enjoy it. Like kevohki and MeloMan, I'm still waiting for The Guardian Legend too. 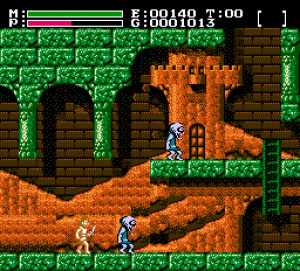 Faxanadu will be nice to have though. I thought age ratings had little correlation as to whether or not a game is going to come out. I mean, there's quite a few VC games that have been re-rated but remain unreleased. Well, you know... its not a perfect system for knowing whats coming up, but its one of the few we have. You right though - World Heroes 2 has been "Coming Soon" list for ages. @Raylax: There's only two OFLC rated games that been rated for ages but haven't come out yet (World Heroes 2 and Strider), so for the most part they're pretty reliable. The USK almost never rates VC games (So these being on there must be an error on their part), but when they do, the games generally get released. Sounds pretty good to me. I've already documented my 50 Games That Have NO BUSINESS Not Being On Virtual Console elsewhere, but these three would be a good start... incidently, none of them were on my list. Doesn't mean I didn't want them (Faxanadu, particularly), but I only had room for 10 NES games. FFMQ and Faxanadu in the US, please. It'll be the first time I've used the Wiiware/VC services in like a year. I'm looking at my NES Faxanadu cart at the moment, which I can't play because someone stole my NES power supply. Need to make a trip to Radio Shack to buy a new one. Anyone know the model I need to get? I love that when Faxanadu is announced, people immediately mention The Guardian Legend and Crystalis. Are we some sort of weird cult that loves these three games? Anyway, <3 Faxanadu, great game, everyone here should dl it. I will also be saddened if it doesn't get a 9/10 on this site. To this bit, though: "so there might be a few spots where you will have to grind on enemies before you're strong enough to continue." The EXP system in Faxanadu is nothing like Zelda II. It only determines your "title" and how much gold you start out with the next time you die or load the game from your mantra. Your stats are based purely on the equipment you are using. I'm not sure if it was Faxandu, but i remember renting an nes game back when i was around 6 years old and the first Boss or so was medusa and it was set in a castle-like setting. Aghhh I wish i knew what game it was! Oh boy, more VC support! Bring 'em on over, Nintendo! If FF Mystic Quest makes it to the states, I will TOTALLY buy it. 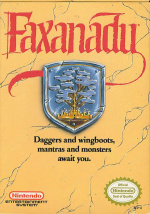 I still have my Faxandu NES cart, but FF Mystic Quest might be worth a purchase. I really could never get into Faxanadu, mainly because you fell like a rock every time you jumped and a lot of the platforming was so precise. I know that there are a lot of people who love it, though, and I'm sure I would too if I really buckled down on it, so good for you, Europe. @28. Could have been Kid Icarus! Nice, I own Mystic Quest on my SNES (the music is awesome). 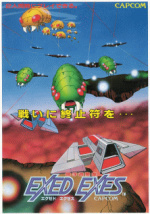 Though Faxandu, I have not played that one, I'll probably get it on NES sometime. Now that we have the return of Hudson produced Falcom games, can we get Ys III now? At this point I don't even really care which version, I just want it. Oh yeah, I also second Adventure Island 2 and 3, and heck, the rest of the AI games. What's the hold up there? I hope that after Final Fantasy: Mystic Quest that Square Enix give us Secret of Evermore, Chrono Trigger, any of them Dragon Warrior games, Final Fantasy VI, and/or Soul Blazer.